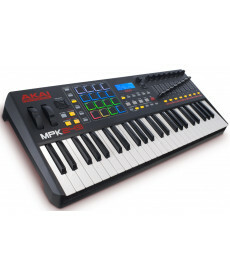 Controlador USB/Midi Akai MPK249. Engineered to be an all-in-one controller solution, the Akai Professional MPK249 is a performance pad and keyboard controller that combines deep software integration, enhanced workflow, and core technologies from the iconic line of MPC workstations. 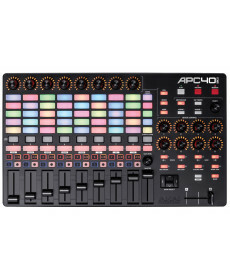 Controlador Midi Akai APC 40 MkII. Controlador USB com 5 x 8 pads coloridos com RGB. 8 faders e 8 knobs. Inclui ainda mais 8 knobs de controlo, botões para acesso rápido aos 8 buses, 2 knobs (volume e tempo), 1 fader master volume e 1 cross-fader. Alimentação por USB. Entrada para pedal switch. Dimensão: 42.4 x 25.4 x 4.6 cm. Peso: 1,8kg. 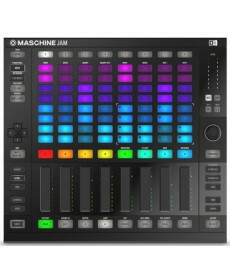 Production and Performance System Native Instruments Maschine Jam.